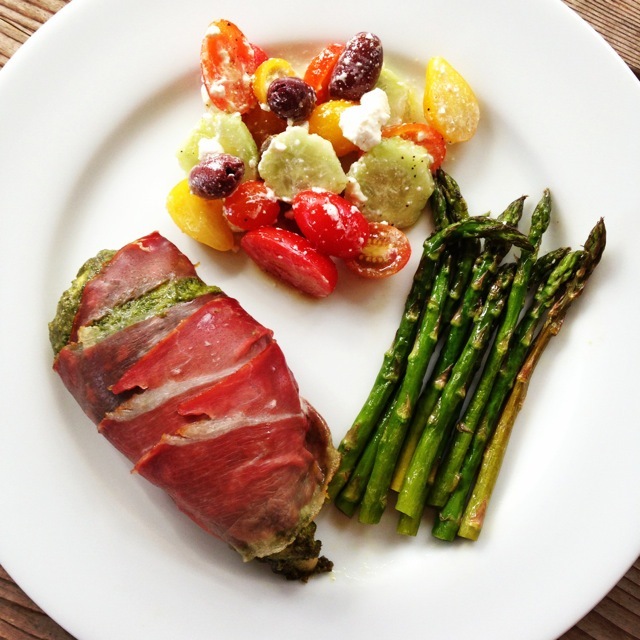 Pesto-Pancetta Pork Tenderloin has been my go-to dinner-party dish for years. It’s easy and yummy and a real crowd pleaser, especially if you brine the pork. But who has time to brine pork?! Seriously, people. This is the look Sissy gave me when I told her we had to go inside to brine. So lately, for a quick and easy weeknight dinner, I’ve been making the same dish with chicken and prosciutto instead of pork and pancetta. Yeah chicken can be a little plain, but trust me . . . once you add the pesto and as many strips of salty Italian ham as you can stand . . . oh my goodness, talk about flavor. Also, if you make your own pesto (click there for my recipe), toss in a handful of spinach leaves when you add the basil — the spinach adds extra vitamins and fiber with hardly any change in flavor! Line baking sheet with aluminum foil. Preheat oven to 350 degrees F. Place chicken breasts on lined baking sheet. Spoon about 2 heaping tablespoons of pesto on top of each breast. Spread the pesto all over the chicken. 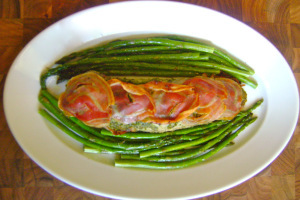 Wrap each chicken breast in two or three pieces of prosciutto. Bake at 350 degrees for 30 minutes. Let cool. Serve with yummy sides. Do you think you might try this one? Or have you found another easy way to make chicken extra flavorful? 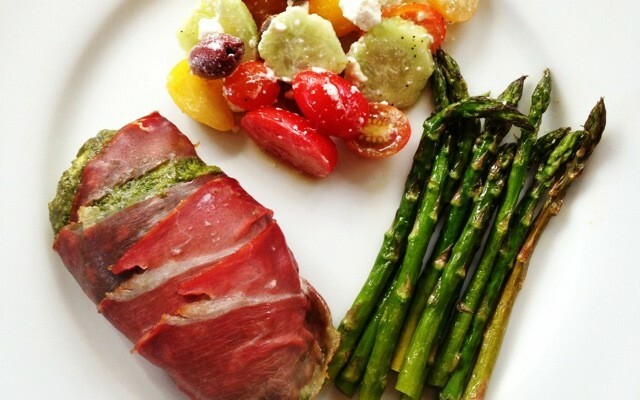 I’m always interested in hearing about your quick and easy dinner ideas! Thank you, in advance, for sharing, friends. And thank you for following! I love being a part of your life.